NOTE: This is NOT the most significant thing happening at Kaleo’s Theology Lab. But it’s so unusual that I had to post a pic that was sent to me. 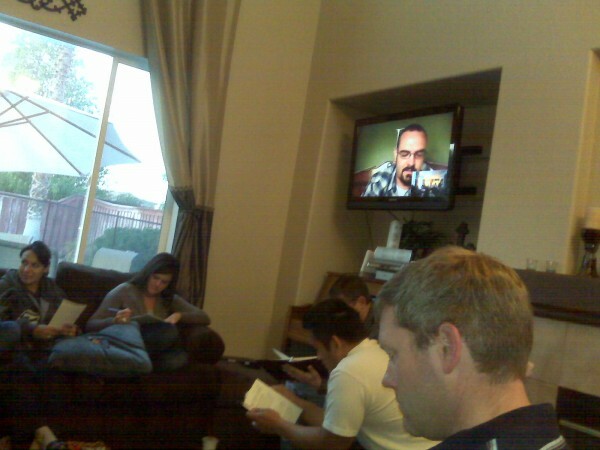 Each week, some faithful believers gather at Josh & Renee White’s house to talk the Bible and its relation to their lives. This week, Jake Dietrich was scheduled to lead, but couldn’t be there due to illness. In the past, the solution might have been to get someone to step up and lead on short notice. But this week, Jake led the group over the internet, connected to the White’s TV, using Gmail’s video chat function. Technologically – very cool. And what I really appreciated hearing was how this change didn’t hinder the work of God in lives, as the people there encouraged one another, confessed struggles and looked together at Scripture for answers. RMG Life: And We’re Off!